The Democratic Republic of Congo (DRC) sits on raw mineral ores worth approximately $24 trillion. However, the income generated from the mining sector is having little direct benefit on the majority of people who live there (thinkprogress.org). The DRC ranks 176 out of 188 countries in terms of the 2015 Human Development Index, and an estimated 80% of the population lives on less than $1 a day (United Nations Development Program, 2015). Malaria remains a serious public health problem in the DRC despite sustained malaria control strategies. Given that nearly all of the DRC population lives in high transmission zones, it has been estimated that the DRC accounts for 11% of all cases of Plasmodium falciparum in sub-Saharan Africa (WHO, 2015). Between 2010 and 2014, vector control with long-lasting insecticidal nets (LLINs) and strengthening of diagnosis and treatment have contributed to a 10% reduction of malaria morbidity and 37% reduction of deaths in children under five (DRC National Malaria Control Plan, 2016-2020). Under current National Malaria Control Program (NMCP) guidance, the DRC seeks to achieve high ownership and use of LLINs among the general population by ensuring that at least 80% of people at risk of malaria sleep under an LLIN to lower malaria transmission. LLIN mass distribution campaigns have been organized with the support of donors, including the U.S. President’s Malaria Initiative (PMI) throughout DRC. Since 2007, the NMCP has planned LLIN distributions every three years. Between mass distributions, LLINs are distributed to pregnant women during antenatal care visits and to children under one year of age at health clinics. Since 2011, the DRC and international partners such as Department for International Development, Global Fund, PMI, UNICEF, and the World Bank distributed more than 40 million LLINs in universal coverage campaigns in all provinces. Routine distribution in health facilities complemented the campaigns. As a result of these efforts, the 2013-14 Demographic and Health Survey (DHS) showed that 70% of households report owning at least one insecticide treated net, a substantial increase from 9% and 51%, as reported by the 2007 DHS and 2010 Multiple Indicator Cluster Survey (MICS), respectively. Starting in FY2018, PMI will also start supporting the school-based distribution of LLINs to increase access. 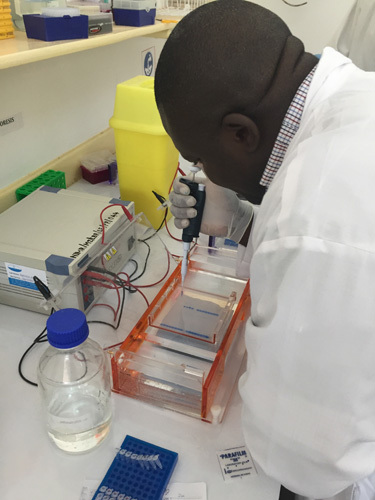 To help evaluate the impact of LLIN use on malaria vectors (seasonal vector distribution, behavior, and species composition), PMI has been supporting entomological monitoring activities in DRC–a key component of vector control activities. In 2013, the PMI Africa Indoor Residual Spraying (AIRS) Project established a subcontract with the National Institute of Biomedical Research (INRB) for the implementation of entomological monitoring (EM) in the DRC. In project year one, data on key entomological indicators were collected from four districts in collaboration with INRB. Due to a lack of data on vector bionomics in the country, PMI expanded its entomological support in 2014/15 from four sentinel sites to seven sites. Entomological monitoring was extended to 11 sites in 11 provinces in 2016/17. During the PMI VectorLink Project, INRB will continue entomological monitoring activities in 11 sentinel sites, namely Kabondo, Kalemie, Kingasani, Kimpese, Katana, Inongo, Pawa, Mikalayi, Lodja, Kapolowe, and Karawa. The level of vector susceptibility to different insecticides used on LLINs and for IRS will be collected from all 11 sentinel sites. In addition to these 11 sites, there will be a province-wide vector mapping survey in Kwango province. Data on population dynamics of vectors, species composition, biting and resting location, and infectivity rates will be collected. The entomological surveillance will help to understand the impact of LLIN mass distribution in the sentinel sites and improve future decision-making regarding choice of vector control tools.